Historical Biographies, Nova Scotia: William Pitt (1759-1806). Though he was never sent off to a formal school -- from his youth he was under the tutelage of his father -- at 14 years of age, William was sent to Cambridge as a "classical scholar." With the death of his father, William, the younger son was left with a limited income.2 He determined to go to the bar and was called at Lincoln's Inn. For a short time he practised law on the "Western Circuit. "3 Soon, however, William was to come to the attention of old friends of his father. One of them, James Lowther, gave William one his borough seats (Appleby); thus William Pitt entered the House of Commons during January, 1781, at the very young age of twenty-two (as his critics were to taunt: "a kingdom trusted to a schoolboy's care"). On February 26th, 1781, the young William Pitt was to make his maiden Speech.4 Burke heard the speech and was to declare, "It is not a chip off the old block, it is the old block itself. "5 William Pitt was then to catch a huge political updraft. The Tory Government of Lord North was then tottering under the disasters in America. With North and key ministers having been turned out of office, there was to be a dearth of suitable men to fill the high offices of government. Those who were still in power advised the king to call on Pitt, no matter his age, he was the man most acceptable to all: he had a seasoning that went much beyond his years and the public knew well the name, Pitt. Though wisely reticent at first (on the theory, I suppose, that one should always say no to the first offer no matter how attractive) Pitt came around to accepting the position as was officially offered by the king. In December of 1783, William Pitt was appointed by the king as "First Lord of the Treasury and Chancellor of the Exchequer," viz., the prime minister of Great Britain. He was then but twenty-four years of age; and, so, the youngest Prime Minister ever known.6 He was to hold this high position for the next eighteen years. William Pitt, like his father before him, was at the head of England during momentous times. Because of his success of leading Great Britain through the The Seven Years War, the father had brought his country to great heights of international power and supremacy. There then ensued, within the decade, the American Revolution which was to greatly embarrass the island nation. The son came into power at a time when the loss of the American colonies was just then, in 1783, being formalized by the Paris Peace Treaty. 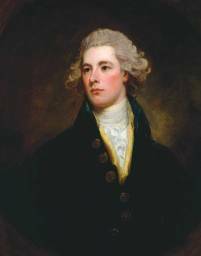 What William Pitt wanted, was to see Great Britain out of this most expensive confrontation with its former American colonies; his post-war policy was to consolidate, pay off her bills, to bring Britain back to prosperity, and to keep her out of foreign wars. For ten years he pursued that policy though there were many in Britain, aristocrats all, who pressured Pitt into responding militarily to events that were then unfolding in France. During 1793, a series of events took place in quick succession such that Pitt could not continue with a policy that had been followed during the previous ten years. On January 21st, Louis XVI was beheaded. George the Third of England sent the French ambassador packing. Diplomatic relations were severed. France invaded England's ally, Holland. Then, on February 1st, France declared war on England. Pitt's historical reputation, is, as Lord Rosebery writes, [together with his father] "the most conspicuous English Ministers of the eighteenth century." Pitt, the younger, was conspicuous as an incomparable manager of men and finances; so too, as a man who would resort to harsh measures, as we have seen in respect to the civil liberties of Englishmen.14 Pitt is also conspicuous in history as the man who abolished the Irish parliament. Thus Pitt took his choice of retirement. However, on May 18th, 1804, a grand effort (yet again) being intended by Great Britain and her allies to defeat Napoleon; Pitt was recalled as the prime minister. It was the same day that Napoleon was proclaimed Emperor of the French.20 The story of England's fight with Napoleon is not one that ends with this further concerted effort, indeed it was not to conclude until we come to Waterloo a number of years later, a story which we will work into our larger history, in time. But the story of William Pitt can now be brought to an end. His health, a problem since childhood, was now to seriously slip. He was to hear of Nelson's victory at Trafalgar in October of that year, 1805, whereby both the French and Spanish navies were annihilated, with the result that the danger of an invasion of England was brought fully to an end. On the other hand, that December he was to get the very bad news of the Battle of Austerlitz (Austerlitz is a place located in modern day Czechoslovakia) a battle by which Napoleon decisively defeated the armies of Russia and Austria, each with its emperor at its head. The news of Austerlitz was to strike Pitt a mighty blow; he was not to get over it. William Pitt, though a man of only forty-seven went to death's door, and, on 23rd of January, 1806, passed through it. "... his ideas of public and private finance differed widely. We are told that, when he could not pay his coachmaker, he would order a new carriage, as an emollient measure. And so with the other tradesmen. His household was a den of thieves." There was two other children born to the Pitts, John, the elder of the two sons, and a daughter, Lady Hester. William and John were to leave no issue. Hester married her cousin Lord Stanhope. The insolent prerogative right of primogeniture, a feudal notion, gave everything to the first born son, viz. John succeeded to all the wealth and title upon his father's death. Primogeniture was introduced into England at the Norman Conquest. In fact the old English custom was to equally partition the lands. Primogeniture worked a considerable hardship on the children, on less, of course, one was the first born male. The only "virtue" of primogeniture, down through the generations, was that it kept the great estates together. Because of primogeniture, sons who were not first born often went into military service; or became ordained and took positions within the Church of England; or, as did the younger Pitt, go to the law. Bigham, The Prime Ministers of Britain (Toronto: Goodchild Co., 1922) at p. 87. As quoted by Bigham, op. cit., p. 88. Rosebery's, Pitt , op. cit., at p. 148. Gibbon's Autobiography (Oxford University Press, nd) at pp. 216-7. To add to Pitt's problems, in 1797, the crews of the Channel Fleet at Portsmouth rose in rebellion. "The mutiny lasted five weeks and spread all over the world." (Rosebery's, Pitt , op. cit., at p. 134.) Fortunately, the Dutch or the French did not know of these naval problems. As Lord Rosebery points out (p.135) it was England's darkest hour; two invasions had been attempted and a third was pending. See Rosebery's, Pitt , op. cit., pp. 164-5. In these years, Great Britain came as close to be overrun by foreign troops as ever she was to be. Napoleon, who gazed often out to the English Channel, was to say all that was needed was but for the French fleet to be in charge of the Channel for twelve hours: it never was to happen. See Green, vol. X, p. 188. Rosebery's, Pitt , op. cit., at p. 191. For example the merchants of London wanted him to take £100,000; the king £30,000 from the privy purse. British History in the Nineteenth Century (London: Longmans, Green; 1924) at p. 114.